Raphaëlle Duquesnoy : records, mix and mastering. Louis Aguilar, French musician who composes mellow, minimalistic folk songs, has already made a name for himself by opening and performing with artists like Moriarty, Micah P. Hinson and Devendra Banhart, among others. 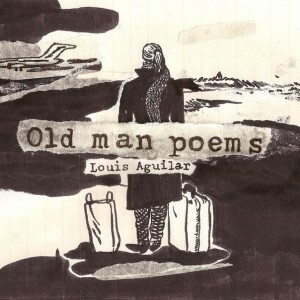 One of Aguilar’s newest songs, « Six Feet Under, » from his latest LP, Old Man Poems (released by Noize Maker Records), is a nearly eight minute long track that will get stuck in your head for a very long time. Aguilar started playing music when he was merely seven years old, picked up the guitar at 11, and wrote, recorded and produced his first album, Hairly Tales, at the age of 16. He quickly gained an underground following throughout France, which paved the way for appearances with established artists. While admittedly lofty comparisons, Aguilar’s music has been likened to Townes Van Zandt and Bob Dylan by the French music webzine La Blogotheque. We were immediately struck at how mature Aguilar’s voice sounds – far beyond his years – and couldn’t help but to hear a likeness to M. Ward in his singing, with a sensibility similar to singer-songwriters like Nick Drake and the late Vic Chesnutt. Album en 200 exemplaires fabriqués à la main.